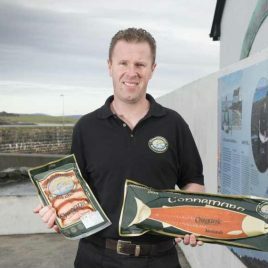 Ballyconneely, 10 km south from Clifden, and the entry point to the Errismore Peninsula, is an ideal place from which to explore the many fine beaches, some with coral strands, situated along the nearby Ballyconneely and Mannion Bays. 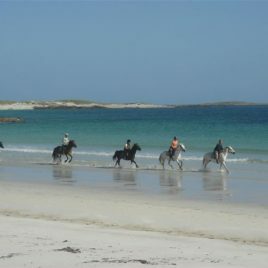 Situated on the isthmus between Ballyconneely Bay and Mannin Bay, 14 km from Roundstone. Mannin Bay has beautiful beaches including a coral strand. To the west is Doon Hill; the derelict 1939-45 coast-watching post is on the side of a ‘folly’ (mentioned by Thackeray) which was built in 1780 by Richard Geoghegan to commemorate the winning of freedom of trade by Grattan’s Volunteers. Less than 1 km west, near the road to Bunowen Quay. in Aillebrack, is the Well of the Seven Daughters. Extensive sand-dunes flank the lovely beach with numerous shell middens. Recently, evidence of early coastal settlement stretching back 5,000 years, including middens of burnt stone, charcoal, shells, as well as stone blades have been found along the shorelines here and add to the excitement of exploration. 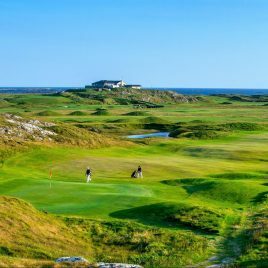 The magnificent Connemara 18-hole golf course is situated at Aillebrack, near Ballyconneely. Ballyconneely is a small village in the west of the Connemara region, County Galway, Republic of Ireland.